Filipino - Tagalog - Bisayan? Do we understand each other? In the Philippines 170 languages ​​are spoken and only 2 of them are official in the country: Filipino and English. My Butch comes from Bicol. She needs help to understand the local Bisayan dialect spoken in Camiguin. 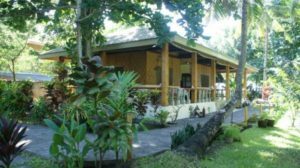 When I first came to the Philippines, I landed on Panay island, in Aklan province. At that time I had been fluent in 3 languages and was eager to learn the local language. So I learned Aklano, thinking that this is the language of the Philippines. WRONG! It is one of the multiple dialects of the multiple languages in the Philippines. After a few months I could chat with the local fishermen and make a dirty joke with the girl at the sari-sari store. Of course, I still had a strong foreign accent. But we understood each other. Then one day, I went over the Panay hills to Culasi in Antique. I looked for a fisherman bringing me over to Mararison island – a real paradise island. I started to chat with them in my newly acquired Bisayan (Aklano). They looked at me, as if I spoke a very sparse Mongolian dialect. I tried everything – even the trees there had other names. I checked my Filipino dictionary. No better result. Finally I got help from a young student who mastered the local dialect, Filipino and English. Mararison is a dream island off the western coast of Panay. This experience killed my efforts to learn the local language. If I couldn’t speak with the people over the hills, how could I speak with people on other islands? After many years I understand many Cebuano expressions. But speak? Oh no, I stick to my rudimentary English. I originally came to the Philippines from a country called Switzerland. Also there people speak 4 official languages and many dialects. The languages are very different: German, French, Italian and Romanche. Basically nobody understands any other language than the mother-tongue. And even worse, everybody grows up with the local dialect or patois. Travel 50 kilometres and they use words, you’ve never heard before. So kids onward from the first grade learn the official language. Here it would be FIlipino, in Switzerland it would be one of the four written languages. In the German speaking part of Switzerland they call this strange language “Hochtütsch”. And nobody likes this artificial language. Germans lough about the mountain farmers. French make jokes about the “Petits Suisses”, Italians wonder about the “Ticinesi” and nobody in the world understands Romanche. Today I did not understand the expression “Alas Puno“. Nobody could help me. My Butch wondered, Gina asked around, but nobody could help. But then came a message from our friend Rob. He sent me a link to an article written by Cito Beltran published in the PhilStar in November last year. The original article is here. “The times they are a changing” and the best example of this is the fact that the Supreme Court decided to uphold the legality of the K to 12 education program which in turn leads up to making Filipino an “optional” subject in college. As expected, the affected teachers and mentors of Filipino in college have raised the specter of 10,000 teachers losing their jobs and the eventual death of programs that promote Filipino as our national language. I for one can understand the wisdom of the Supreme Court magistrates who’ve limited the teaching of Filipino to K to 12. Honestly, if you can’t make Filipinos learn, love and embrace Filipino as their language in a span of 13 years, then there is something seriously wrong with your teaching method and adding two more years in college won’t make much of a difference. Beyond that, there is also the possibility that Filipino as a “national” language only lasted this far because it was an imposition of the prevailing culture or class in society. But as I quoted from Bob Dylan, “the times they are a changing” and Filipino may have fallen into the realm of those cultural icons or jewels that no longer shines or holds value and relevance. How can we have a “National Language” that does not have formal and official use or application? Most documents with government are bi-lingual at best; representations, debates and discussions of the official kind are mostly done in English. So if you don’t use it you lose it. In the case of Filipino if you can’t use it – you lose it as well. Of course, not all is lost as there is still secondary level or K-12 and there lies the last chance for the lovers of Filipino to redeem the language and themselves. Just like in business, now would be a good time to ask the students, listen to the students, work with the students on how we can save what people want to retain as our mother tongue. To continue reading please go here. Language is one of the most important keys to culture. Maybe you want to read our “Culture page” or just have a look on your Peso bill. 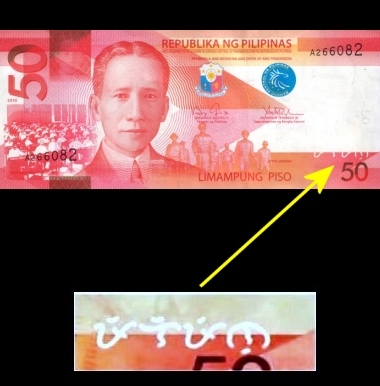 The original language of the Philippines serves as a security mark in the lower right corner of each banknote. Keyword: Baybayin. Baybayin – the original Philippine language. It is extremely important that people have their local identity. This is what I call “Home”. But especially young people need a language which they can speak and understand nation-wide. Imagine a young and intelligent student wanting to leave the province and build his/her future in Manila. Without mastering Filipino (Tagalog), there is no chance. Give your young people a chance, let them talk at least one common language. English is good, but it isn’t the best solution. Is it? Let the next generation learn Filipino! And now I understand “Alas Puno“. Thank you Rob, thank you Cito Beltran . Wanna know? “Whenever,” meaning that the ferry will leave the terminal “whenever” it gets filled with passengers.